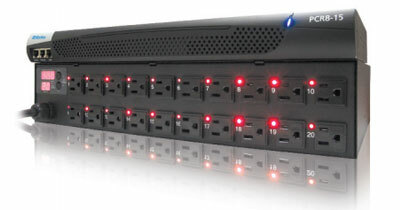 The Raritan PX family of high-quality, intelligent rack power distribution units (iPDUs) offers real-time remote power monitoring of current (amps), voltage, power (kVA, kW) and energy consumption (kWh) with +/- 1% billing-grade accuracy, even at individual outlets. The PX series offers hundreds of models to meet all your data center applications, including models with remote outlet switching, individual outlet metering, high-power for blade servers and high-density applications, and 400V power distribution. Available in eleven colors that help reduce errors and make it easier to identify power feeds, and perform troubleshooting to minimize downtime. Ensure that IEC power cords don’t accidentally come unplugged from servers when technicians are working on racks. The PX series comes equipped with USB ports to support Wi-Fi networking, PDU to PDU cascading, webcams, quick setupand iPad integration.